Tree stands used by white-tail deer hunters are very popular but highly dangerous especially climbing tree stand models where the foot portion will suddenly plummet without warning when transferring weight. Full body harnesses properly designed with a chest strap that will not strangle are essential and are only discovered by hunters if they suspend themselves close to the ground to see how straps move under load. Attachment of the strap to the tree is best done by cinching and without a buckle due to hunter threading straps in a way that only holds partial body weight and which will be ineffective at the time of a fall. Permanent attachment of a connection cable between seat and foot portions may help save lives if the foot loops are within reach and allow retrieval of a tipped or jammed foot portion. Keeping the feet in the foot straps is not a substitute option to a permanent connection, which should be provided by the manufacturer of the tree stand. 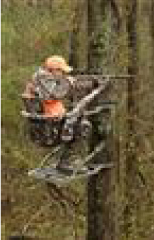 Hang-on stands offer the hunter more hope for survival due to the presence of a climbing structure (ladder). This can help relieve pressure on a person hanging in a suitable full body harness so they can breathe, recover and use the descent device on one side of the stand. A lifeline system with a grab or triple hitch device is a better choice for fall protection. One additional device is an over-hand knotted loop in the lifeline that can be used for a foothold to lift the body. The hunter can then slide the first locking device downward and subsequently re-tie the knot in order to facilitate descent. Ladder stands are difficult to swing into position and secure safely to a tree unless three people are available. Waiting for rescue in a full body harness and relieving venous pooling in the legs periodically with suitable webbing loops is simply not a feasible solution for the hunter mentality unless rescue help is very close by (most rescues will take several hours even if the alarm is successfully given to a co-hunter quickly). Dealer sales persons are typically not educated to these life-death problems in a showroom and manufacturer instructions and labels often fail to communicate the urgency of the situation. 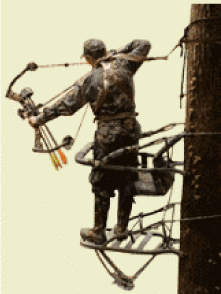 Responsible manufacturers and dealers recognize that a full body harness system with a practical self-rescue system that can be operated reliably within a few minutes is an essential part of the climbing tree stand design itself.